Our roll top desks are brand new but have the detailed feel of an antique desk. Roll top desks are still as popular today as they were centuries ago. Trying to keep to the feel of vintage, antique roll top desks is our woodworker’s goal. Our Amish handcrafted roll top desk is sure to become a treasured family heirloom that will be passed onto generation to generation. 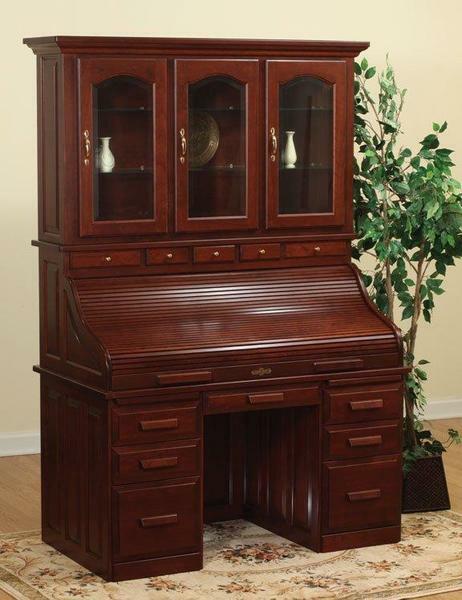 Our Solid Wood Roll Top Desk with Hutch Top is available in a variety of wood types and stain choices. This desk comes standard with raised paneled sides and dovetail drawers with full extension slides. Inside Depth of Desk: 27"
Key Hole Height: 25 1/4"